正面 这种新颖的铸币管能装10 x 5盎司美丽美国银币。 组织你的收藏，使其易于存储。 存储你的投资的完美之选! 这种新颖的铸币管能装10 x 5盎司美丽美国银币。 组织你的收藏，使其易于存储。 存储你的投资的完美之选! 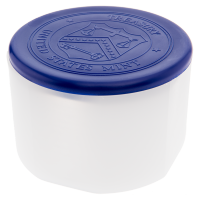 5盎司美丽美国银币空管 This original mint tube holds 10 x 5 oz America the Beautiful silver coins. Organize your stack and make it easy to store. Perfect for storing your investment!